Here I am, slightly later than intended, posting my offering based on Linda Elbourne's 'Playing Tag' in the July Craft Stamper magazine. I decided to go with a green theme this time, as I was feeling very summery, and wanted to reflect the foliage and freshness of the garden. I wanted to incorporate lots of birds into my project, and use my favourite Paper Artsy and Elusive Images bird stamps. I started by choosing a colour palette of Willow and Juniper Adirondack Inks, and Bundled Sage Distress Ink. I applied Willow and Juniper paint dabbers to my canvas, and Juniper to my Grungepaper. 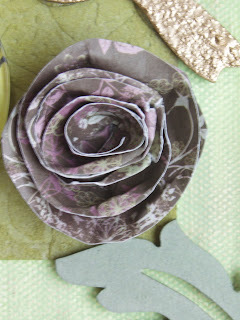 As I mentioned in my sneaky peek, I used the Tim Holtz Cracked effect folder to emboss my Grungepaper. 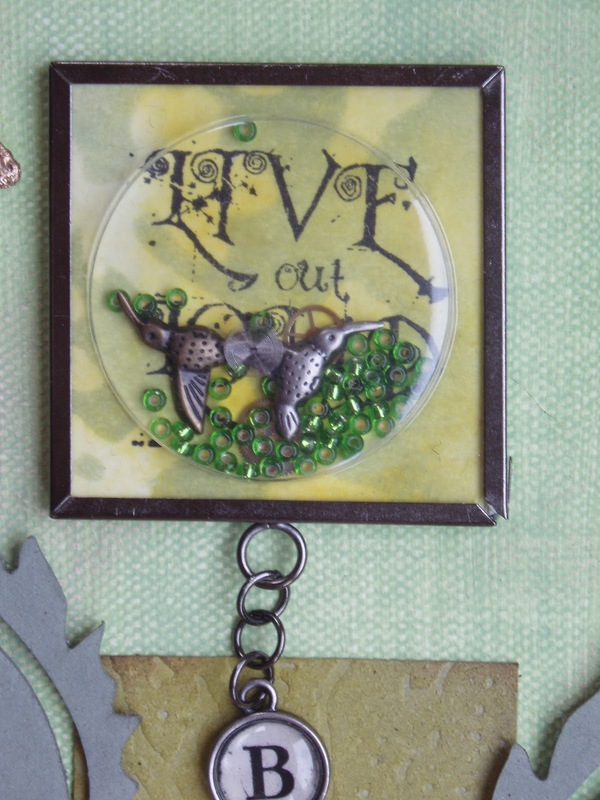 I used a lovely Tattered Angels mask from the Blossom set on my tag, keeping to the natural theme. 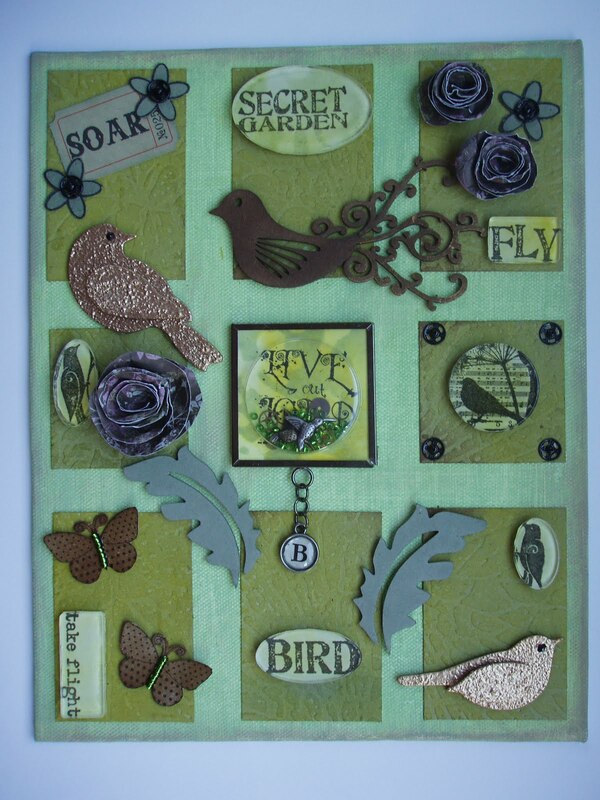 I had some chipboard leaves which I coloured with Bundled Sage, and a lovely Scrap FX Bird which was coloured with Vintage Photo DI, bringing in an element of brown for contrast. I used a little bit of Gold paste on the tail of the bird to age it slightly. I added a couple of Wendy Vecchi butterflies, and some handmade flowers, all with a brown tinge. I had never worked with the Ideology fragments before, but enjoyed finding images small enough to fit the pieces. I love the effect that embossing over gold Paint Dabber gives, so thank you Linda for this technique, I will be using it again! I added a dot of black Pearl Pen to the birds for their eyes, which seemed to work well.Inside the memory capsule, I placed a couple of little humming bird charms, some Paper Artsy clock fragments, and some green seed beads. 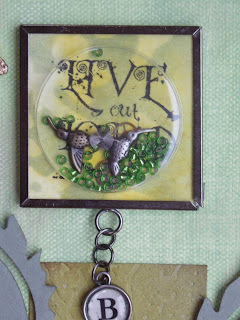 I stamped one of my favourite phrases from the Live out Loud themeplate from Elusive Images, I love the font on this one. 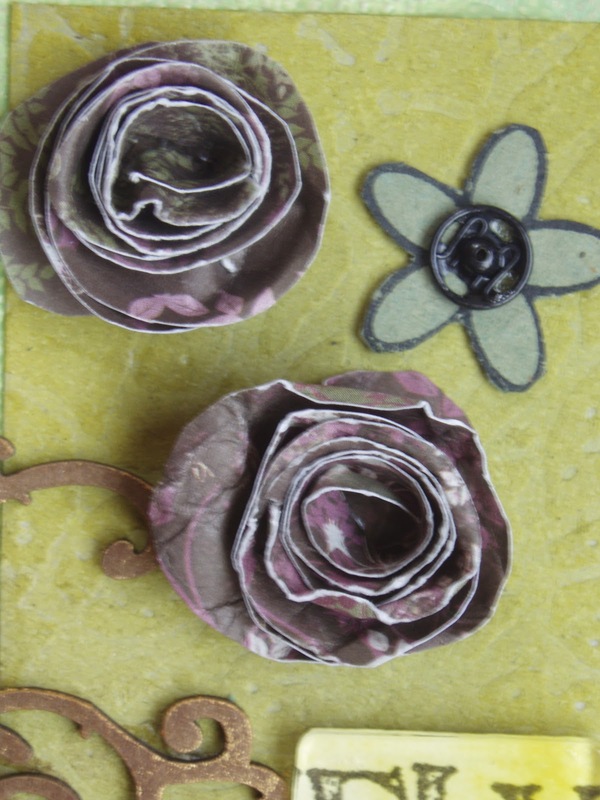 I had fun making the small flowers, as I had never made these before. They are really easy, and take no time at all. So I will be making lots more of these too! They will be handy for using up scraps of pretty papers I think. As you will see, I went for a rectangular canvas; it was what I had to hand. Therefore, my grungepaper pieces are a mix of square and rectangles. I played around with the combinations before sticking them down, and decided on this conventional pattern in the end. I have really enjoyed this project, although my time was tight, and would certainly like to make more of them, so thank you Jo for choosing the project, and thank you Linda for the fabulous idea in the first place. This is wonderful! You know I love green so the colours are amongst my favourites and I've had a bird 'thing' going on for the past few months so you've got me there too. I love all the elements you've chosen and I'm glad you didn't forget the embossing on gold dabber technique like I did (I was so annoyed with myself). It's really effective and gives such lovely texture. Love the handmade flowers too - need a tute on those buddy! Your work and the effort you have put into this is really beautiful - I feel that I have a long way to go to even attempt anything so complex. This is really good and the colour scheme very gentle. I like hand made flowers and birds on projects so just up my street. Absolutely love this Judith!! The flowers are just so sweet. Well done Judith, lovely soft colouring. You know anything green always appeals to me! I love those flowers, they are great and the fragments work really nicely don't they. Great interpretation of the original project and again really interesting how we have all come up with quite different approaches. Beautifil Judith ... fab choice of colours ... Thank you all so much I am loving every minute of these projects and reading about how you have all made them totally your own!